Thyroid function tests are blood tests which are performed to check the levels of the chemicals (hormones) made by your thyroid gland. Some thyroid function tests also check the level of a hormone made by the pituitary gland in your brain, which acts on your thyroid gland. Chemicals or hormones released by thyroid are released into the bloodstream and they act as messengers, affecting cells and tissues in distant parts of your body. Thyroid hormones affect your body's metabolic rate and the levels of certain minerals in your blood. A globally increasing population with the thyroid problem is expected to drive the demand for the thyroid function test during the period of study. Geographically, North America dominates the thyroid function tests market driven by best in class infrastructure, easy access to healthcare, higher awareness about thyroid and higher spending by the citizens towards healthcare expenditure. North America was followed by Europe and Asia-Pacific as second and third largest markets for thyroid function tests market. Asia Pacific is projected to have the fastest growth, owing to rapidly developing medical infrastructure, increasing medical tourism, increased spending and increasing awareness amongst population in developing nations such as China and India in this region. This report identifies the global thyroid function tests market size in for the year 2014-2016 and forecast of the same for year 2021. 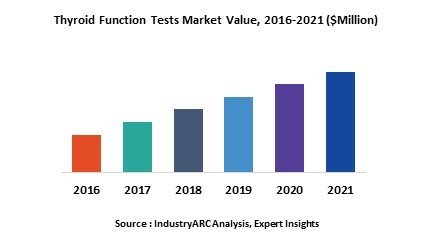 It also highlights the market drivers, restraints, growth indicators, challenges, and other key aspects with respect to the thyroid function tests market. Health Watch Tele Diagnostics Pvt. Ltd.